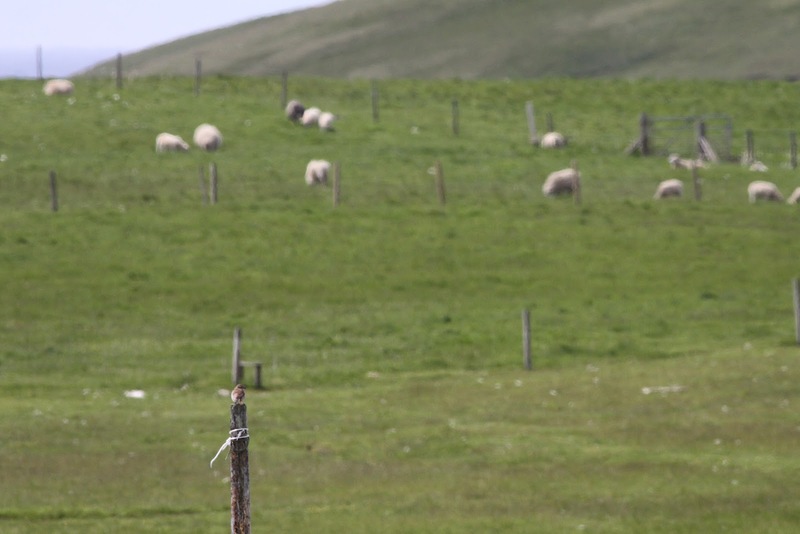 Fair Isle Bird Observatory: the Warden's diary: Marsh Ado About Something. 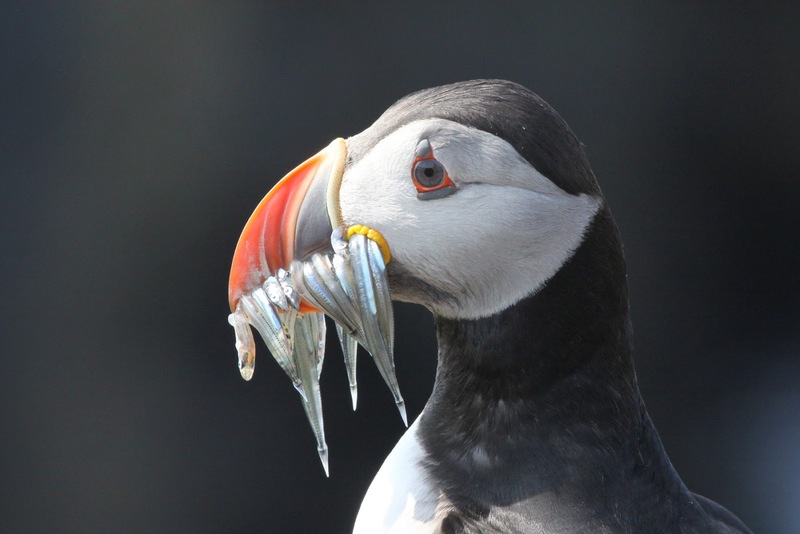 Hopefully Puffins will do well this year; there are certainly a lot of fish being brought in recently (albeit mostly rather small sandeels). This one landed next to me as I was monitoring Kittiwakes at the Holms earlier in the week. 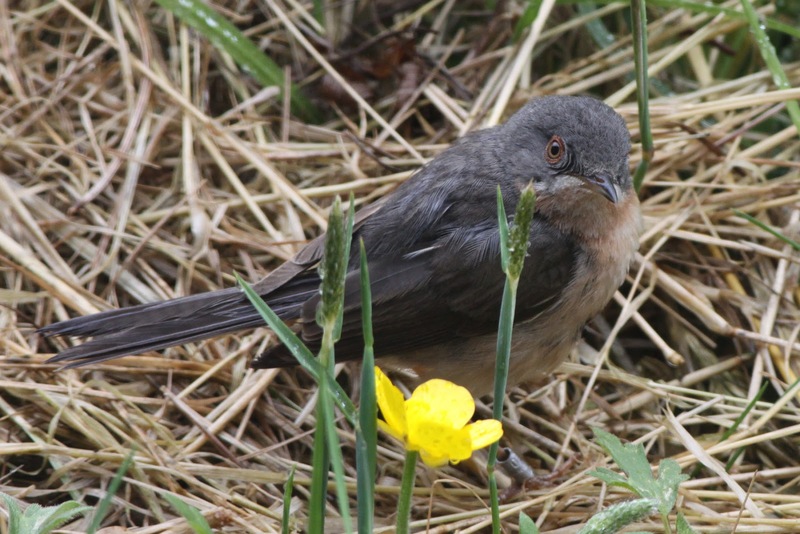 The male Subalpine Warbler continues to show well in the Obs garden. Perhaps even more surprising was that the Subalp’s arrival was accompanied by a small flush of freshly arrived warblers. The two lingering Marsh Warblers in the garden were joined by a third, with another trapped in the Plantation and the fifth for the day seen at Schoolton, whilst the Reed Warbler count doubled to two and two Blackcaps also turned up (whilst an unstreaked and unringed acro at Setter was a different bird to those listed above, but didn’t show well enough to be positively identified). 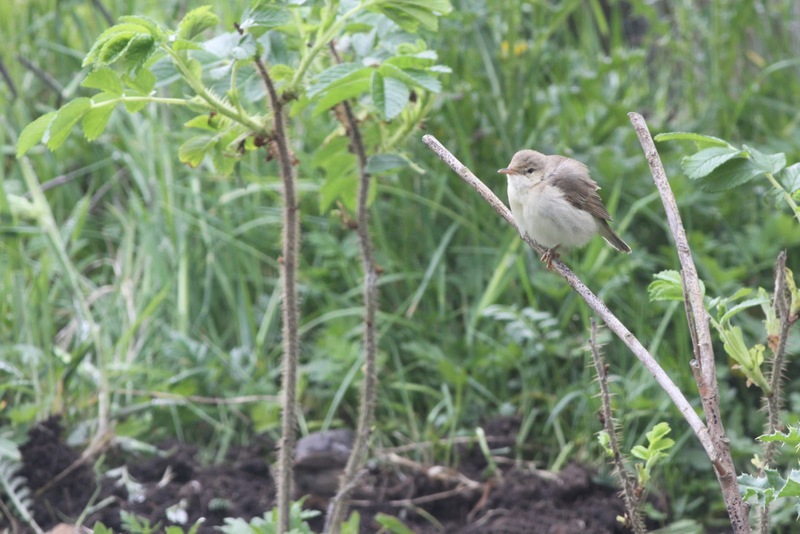 One of the lingering Marsh Warblers seems to have taken to keeping an eye on the Subalp (visible here on the ground between the two rose stems to the left of the Marsh Warbler). 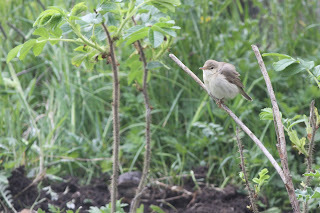 Five Marsh Warblers in a day is a good count, and unusual to occur so late in the spring. The last week has also seen occasional singles of Chiffchaff, Willow Warbler and Whitethroat arriving. Another typical late spring migrant was a female Red-backed Shrike at Chalet on 24th-25th, the 19th of the year in a very good spring for this species. 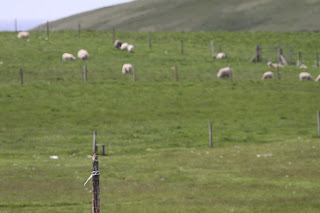 Red-backed Shrike surveying Fair Isle towards Malcolm's Head. 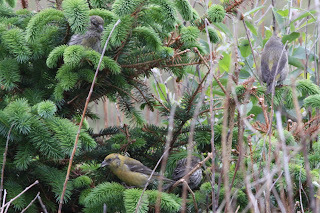 Crossbills have also been seen regularly, although all the sightings may relate to the same group of 12 that have been roosting in the Obs garden (4 have now been ringed, so we may be able to confirm this if they hang around longer), whilst lingering birds from earlier in the spring included at least one Robin, Blackbird and a couple of Tree Sparrow. The Crossbills have included a mixed bag of males, females and juveniles. This male shows relatively prominent wing bars, but not enough to be anything other than a well marked Common Crossbill. A Carrion Crow (25th) and a couple of Swifts were also seen passing through, whilst waders included small groups of Curlew and Lapwing as their post-breeding dispersal gathers pace and the first Bar-tailed Godwit of the year (a breeding plumaged bird at Houll on 24th). The group of 22 Greylag on 23rd were also presumably failed (or non-)breeders, the Tufted Duck continued his lonely stay at Golden Water and singles of both Red-throated and Great Northern Diver were seen on 25th when 2 Storm Petrels were seen from the Good Shepherd. 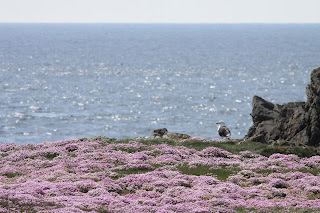 A Great Black-backed Gull looks out over the sea from Greenholm, which is looking rather resplendently carpeted in Thrift at the moment. 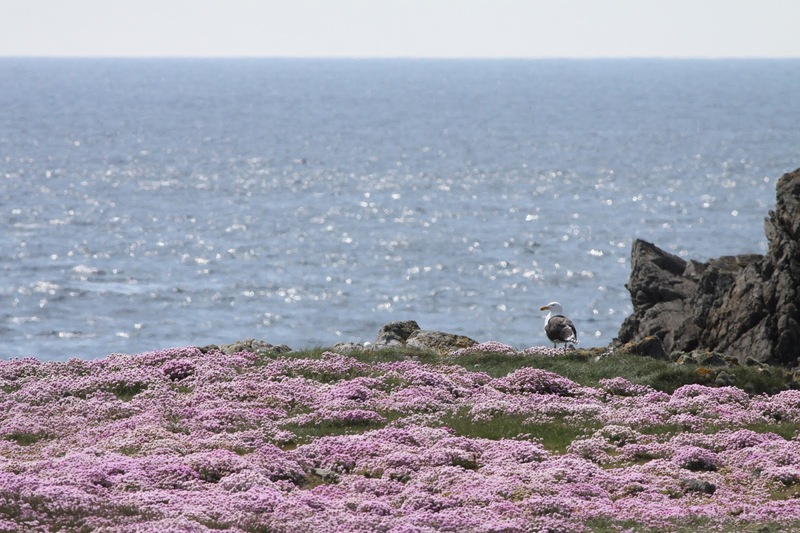 I’ll get a seabird summary published soon, as we continue to press on with the monitoring work, but in ‘other breeding news’ the first Pied Wagtails have fledged (at the Obs), with at least two more pairs thought to be present. So, with the wind set to be a light south-easterly by tonight (and strong southerly tomorrow), will there still be more to come? Well, it's July on Monday so surely things will stop moving soon, but the way this spring is going, I'd not bank on it.